Queens District Attorney Richard A. Brown announced on Oct. 1 the hiring of three Class of 2018 graduates: Dylan A. Nesturrick (back row, fifth from the left in photo), Christopher Theodorou (back row, far left) and Nicole Vasquez (front row, third from left). 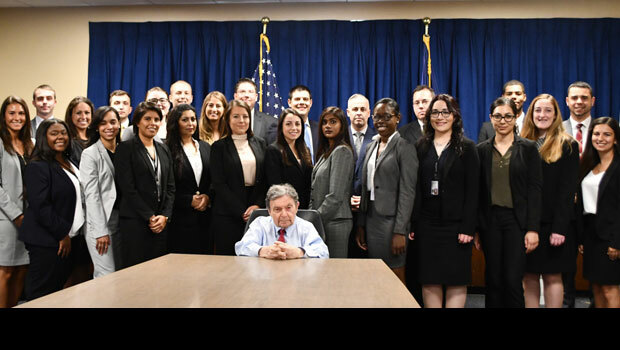 The alumni were sworn in as part of a class of 25 new assistant district attorneys. Nesturrick, Theodorou and Vasquez will be assigned to the Criminal Court/Intake Bureau, after which they will be offered the opportunity for assignments in the Appeals Bureau and the Investigations Division. Then they will enter an intensive trial training program before being assigned to the Supreme Court Trial Bureau. Read the full press release (PDF) on the Queens County District Attorney’s Office website.